I'm 66 yo female, horse farm owner, equestrian. Active. I had bronchitis in August. Given prednisone + levaquin 500mg. 10 days after starting Levaquin I began having pain in right biceps area. Thought it was a muscle strain. It persisted to point where I had trouble steering in a car and, even now, months later, I can't reach over to open the passenger door with that arm or reach up to turn off a light switch from bed or reach my left scapula. Limited range of motion. However, I can carry heavy bags of groceries! Go figure. A neurological chiropractor I respect gave me some gentle exercises to help. I was also taking some ibupropen. The arm seemed somewhat better, but lately seems worse again. I sometimes also feel a dull ache in my right hand and/or forearm. My neck has also been quite stiff since the Levaquin incident -- I have trouble turning my head to the right. A doctor mentioned that I might have 'frozen shoulder' and recommended an MRI which I'll soon take. There was also some tenderness upon palpation in the shoulder area. If this is the case, can it be treated. I'm horrified that I may not have full use of my shoulder for the rest of my life. I lost my life partner of 40 years last March. He was a wonderful sculptor. So I'm sure that my system has been more run-down than usual due to the pain of the loss. That's the story in a nutshell. Thanks for any help. Hello Carol. Thanks for sharing your experience and for asking. First off, why in the world did the doctor give you Levaquin for bronchitis? Did they test to verify that you had bacterial bronchitis? The vast vast majority of bronchitis is viral, which antibiotics won't touch. Next, Levaquin and steroids are a bad combination. I'll just assume that your doctor never bothered to educate him/herself adequately. Questions re: that farther down. I assume that you are off the Levaquin and Prednisone? FYI, if you have issues with bronchitis, have your chiropractor adjust your thoracics. I have historical issue with bronchitis, and long story short, I can self adjust a couple specific spots and nip it in the bud when I feel it coming on. I'll tell you why later if your curious. medical/health perspective, the loss of a loved one is a HUGE stress on the system and immune system. The stress can literally throw your system out of balance and lead to illness and such. That is actually a factor that is a clue to identifying the cause of illness/disease. 2. Removing a Levaquin factor, yes, 'frozen shoulder' can absolutely be treated. Adding the Levaquin factor, the damage may or may not be able to be healed. As far as I can tell, people either have pain and symptoms for up to a year and then slowly get better, or they have significant tendon and connective tissue problems for the long term. Let's shift your 'horror' into 'motivation'. 1. How bad was the bronchitis? 2. Do you have a history of bronchitis? 3. Did the doctor do any tests to determine whether you had viral or bacterial bronchitis? 4. Why do you have limited range of motion? Becaues it hurts too much, or because it literally won't move? 5. What all directions is it limited? How limited is each direction? Can you rotate it in it's socket? Can you reach up to the ceiling? Etc. The actuall question is, does it move in some directions but not in others? 6. Describe the pain. Where exactly? Sharp? Dull? Throbbing? Shooting? Constant? Intermittant? Only when moving it? 7. Is it hard to turn the neck because of tightness like the muscles won't let you turn that way, or stiffness, or pain? Let's start with that. The answers to those questions will give me more to work with. Use the 'comment' link below to reply. i am 77 yrs old and had an ongoing bronchitis he adache, sinus pain, severe headache, nausea and loss of appetite. i was given a zpack and steroid week dose by one physician with no results. i then went er for a ct of brain and sinus, both neg. low grade bronchitis noted and the er doc ordered 750mg levaquin. i now have severe shoulder tenderness. burning and pain, dizziness, nausea, headache and very bad taste of all foods. I'm sorry to hear you're having extra health issues from the Levaquin. The first thing I would do is read through all the Levaquin on this site. The second thing I would do is see if you have any Magnesium in your home, and if it's NOT Magnesium Oxide, I'd start supplementing as described on the Magnesium Dosage page. Daily hot bath(s) with a few cups of epsom salts would be good too. You already had active health issues at play, but the Levaquin sounds like it's taking it's own toll. My story is almost exactly the same: chronic broncitis, shoulder and bicep pain (same day I started medication and still persisting a month later). 500 mg for 10 days, limited range of motion, can carry heavy bags, very painful. I am 54 year old female in great shape. After a couple of weeks of bronchitis, I dropped by a walk-in clinic and got a prescription for Levaquin. The nurse did mention that if I had muscle pain, I should call them. I took the prescribed amount for 4 days, and then started to feel stiff and sore. I am 66 years old, so this is not so unusual, but that evening while getting down on the floor to help my granddaughter take her bath, I realized I couldn't get back up. Next morning I had severe pain in my arms, legs, shoulders. My knees were the worst. I did not take another pill, but the next day I was worse. I knew it must be the drug. I called the clinic, the doctor sent word for me to go to an ER. I said I was coming in to the clinic to discuss this, and when I got there, the doctor told me I was experiencing a very very rare allergy to the drug. Not a side effect, but my allergy. I could go to a hospital for IV's and total rest, or go home. i went home. For the next 4 months I could hardly walk anywhere. Getting up and down was excruciating. The pain in my arms began to subside, but the knees were no better, the left knee getting worse. I visited a GP, who found a lump behind my knee, and took X-rays, and ultrasound of the knee. I had a Baker's Cyst behind the knee. I was sent to an orthopedic surgeon, who took an MRI and found there was a miniscus tear on the knee as well. He suggested waiting a while longer, and our plan would be to drain the cyst, and if things got even worse, he would surgically repair the tendon. It has now been 7 months since the Levaquin, and I still have arthritis-like pain in the knees, which I never had before. I am fortunate to be able to walk now, and we have put off any surgery, since I am improving. I try to walk 2 miles daily to keep going. I still have knee pain, but am happy to be able to follow a normal routine. The experience was devastating. I am a very healthy person in every way. I'm no athlete, but quite active and agile for my age. This was very frightening, as i could imagine my lifestyle reduced to sitting in a chair. Not a pleasant picture. The doctor who prescribed this was quite anxious for me to be on my way, and he did not want to discuss any treatment or plan to recover. I would caution anyone to never never take this drug. My pharmacist completely agreed that it is dangerous, and the tendonitis reaction is not at all as rare as the doctor said. Yes, unfortunately, most doctors want to scoot patients like you out of the office as quickly as possible. They don't know why you hurt, don't know how to help you, and don't want to take any responsibility that they might have something to do with your pain (much less admit that they are clueless about how to help you). Joshua Replies to Nancy - "Levaquin didn't have side effects, YOU are allergic"
"Not a side effect, but my allergy." That's BS. He's got no evidence of that. Side effects like you describe are well known and if he spent 5 minutes researching the issue he'd know that. That's great you're staying active. That's great you can still be active. Unfortunately, while it's possible that symptoms will go away, the way the body interacts with levaquin, you would benefit from actively helping your body recover. Levaquin depletes the body of nutrition, specifically Magnesium. If you don't replace it, the body has a hard time recovering. It's great news that you're recovering some, that's a really good sign. If that continues, great. If it doesn't (and even if it does) then it's high time to help your body return to normal. Went to dr for bronchitis and he put me on levaquin. A weeks worth, twice a day. I made it 3 days. Every joint ached. Started feeling better the next day. Now, about a week and half later, I can't use my left arm. I thought it was a pinched nerve so I went to chiropractor. Hi Erin, sorry to hear that. Well, it's the Summer Of Self Care, anyway. I wouldn't leave this to time to 'heal'. as it may well be a lot of pain and a long wait. Why exactly to the doctors think the muscle is deteriorating? And, what did the doctors say as far as the cause of your pain? It was prescribed to treat a recurrent bronchitis infection that amoxicillin did not cure. Took 750mg daily for seven days. cured bronchitis 3 weeks later I developed severe pain in both shoulders. It has been 1.5 month since onset of symptoms and it is no better. Have been to the Doctor 3 times in a month. The 5 mg prednisone he gave me helped for about 10 days but it came back and will not stop. Pain is constant. I am taking 800 mg of Advil every 12 hours to be able to stand it, but it still hurts with the medicine. My wife has to help me dress in the morning, and I can only perform half of what I am supposed to do at work. Give us an update on where you're at now and how things have progressed or regressed. What have you done to try to recover? 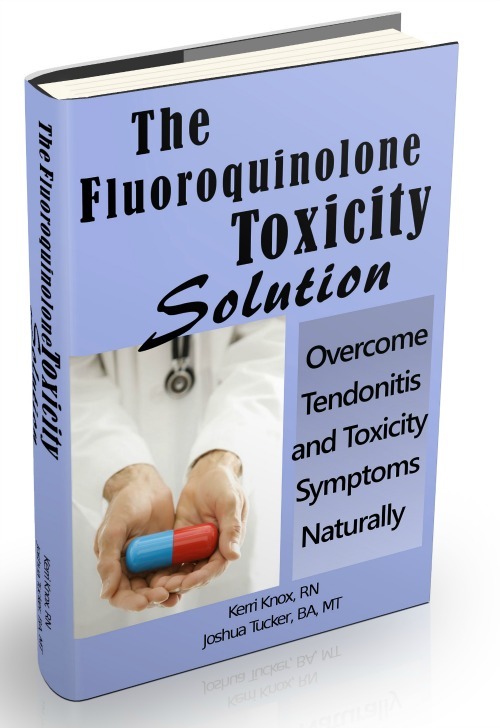 Prednisone is contraindicated for fluoroquinolone victims. Doctors should know that. Too much ibuprofen can damage the gut lining (and thus lead to other problems), so while painkillers may be necessary to get through the day, Ibuprofen isn't a good long term plan.